In 2011, Marcia came to Rock Steady to observe a class and never left. So amazed by the program and the people, she volunteered for over a year, learning the ropes from the coaches, participants and care partners. 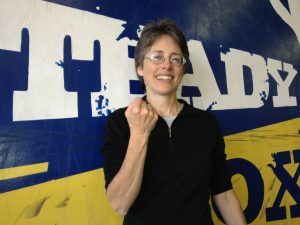 After completing Rock Steady Boxing Training Camp in October 2012, Marcia joined RSB as a Coach for the PD3 and PD4 classes, where she continues to learn from each and every participant. A 1982 graduate of Ball State University, Marcia went back for “round two” in 2007 and earned a Masters Degree in Gerontology and Wellness. Marcia’s father had been diagnosed with Parkinson’s disease and, subsequently, dementia with Lewy bodies. Learning to focus on what he could do (instead of what he could not) the entire family kept him moving, giving him a better quality of life throughout the disease. Recognizing the importance of movement, Marcia became certified in Body Recall®, an exercise program geared toward extending independence for older adults, and also in Drums Alive!®, a rhythmic whole brain, whole body exercise program, and has been teaching ever since. She believes movement, regardless of age or health, helps maximize the potential of the brain and the body. Unable to say no to a good adventure, Marcia has hiked the entire Appalachian Trail, bicycled from Indianapolis to Kansas City, and has participated in a 340 mile kayak race on the Missouri River! She has all the skills, tenacity and tough love found in a Rock Steady Coach!